Palm Beach, Florida is one of the most popular destinations in the United States for tourists. Its beaches, warm weather, attractions, and culture keep people coming back year after year. If you’re looking for the best Palm Beach luxury hotels to stay at, look no further. The list below includes 10 of the most highly recommended 4- and 5-star luxury hotels in Palm Beach Florida. The Colony Hotel in Palm Beach has been open since 1947, hosting U.S. presidents and even European royalty. It sits in the perfect location; only steps away from Palm Beach’s beautiful attractions, Worth Avenue, and the beach. Guests rave about the perfect mix of this hotel’s old and new aesthetics, making it one of the most beloved boutique hotels in the area. The customer service at this Palm Beach luxury hotel is outstanding, offering spa services, fitness and fishing expeditions, babysitting services, fresh flowers, and almost anything else a guest’s heart can desire. Voted as one of the top resorts in Florida, the Tideline Ocean Resort gives guests beachfront views and access to the amazing beach. The owners of this amazing oceanfront Palm Beach resort have strived to create an exotic oasis and they succeeded; with verandas, botanical beauty, and every amenity you could ever need. Guests can use their fitness center, spa, state-of-the-art pool, or eat at their world-renowned restaurant. If you’re looking for a Palm Beach luxury resort that takes you away from your everyday life, Tideline is the place for you. If you love golf and luxury, the PGA National Resort and Spa is the choice for you. Guests can enjoy 5 championship golf courses, a world-class spa, private sports club, and amazing luxurious resort rooms. There are numerous dining and bar options, pools, and a world-class concierge service. Rooms are modern, spacious, and comfortable. From golf to relaxation and spa treatments, this luxury resort in Palm Beach Florida has something for any guest to enjoy. Inspired by the beach, the Marriott Singer Island Resort sits right on the beach, just moments from the best attractions around, between Jupiter and West Palm Beach. 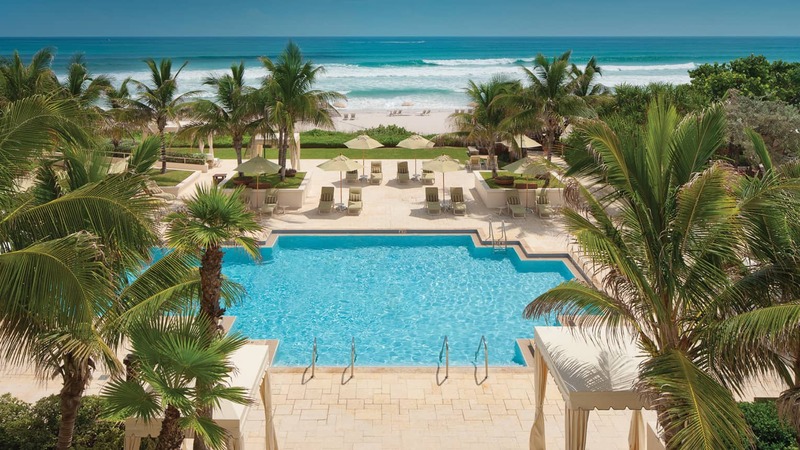 One of the best luxury hotels in Palm Beach, it boasts 2 outdoor pools, a full-service spa, state-of-the-art guest rooms, and a fitness center. With over 190 guest rooms, they have perfect options for anyone. There are 2 dining options and even a Tiki bar for the adults. Guests can even partake in outdoor activities, like biking, jet-skiing, scuba diving, surfing, and volleyball. 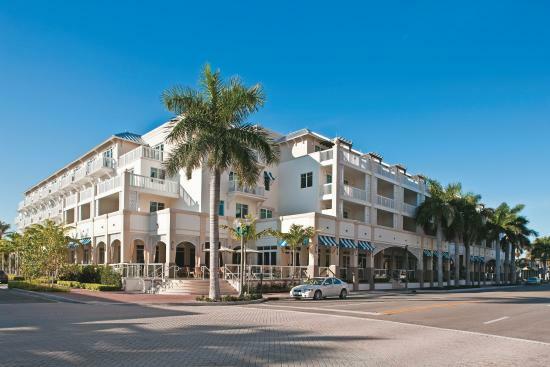 Right in the heart of Palm Beach, moments from the beach and Worth Avenue, sits The Chesterfield hotel. It has a classic, old-world charm that is unrivaled by any other, making it a must on the list of the best Palm Beach luxury hotels. Guests can enjoy tradition High Tea, unique guest rooms, delicious international cuisine, and live music every single night. 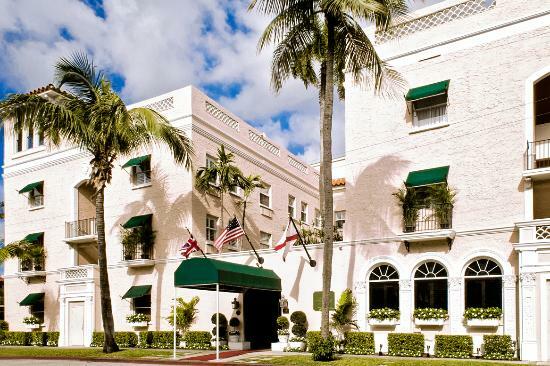 Originally built in 1926 and named as a city historical landmark, The Chesterfield blends amazing old-world charm with modern amenities, being one of the best luxury hotels Palm Beach Florida. They even boast babysitting services, family-friendly amenities, and accept guests’ furry companions. This amazing luxury hotel in Palm Beach Florida sports elegant Spanish Colonial architecture, beautiful fountains, and tropical courtyards. The Brazilian Court is a medium-sized hotel, with only 80 rooms; its intimacy being one of its best qualities. The aesthetics boast a glamorous 1920s infusion, setting it apart from other Palm Beach luxury hotels. Guests can get a bite to eat in their amazing Café Boulud, visit their salon, or take a dip in their secluded pool. The Brazilian Court has made numerous “best hotels” lists all over the globe, easily making it one of the best Palm Beach luxury hotels. 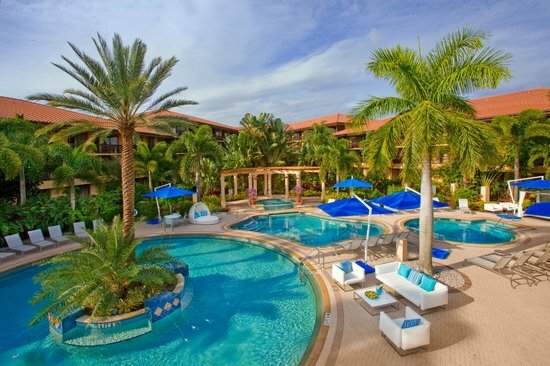 The Seagate Hotel is located just minutes from Palm Beach in the charming town of Delray Beach. This boutique hotel in Palm Beach Florida features a state-of-the-art spa, a fitness center, and an amazing restaurant. Guests can enjoy the hotel’s beach club and country club, where they play golf or enjoy one of 3 pools. Guests can also shop at two boutiques located inside the hotel. One of the hotel’s largest claim-to-fame is their 5 stunning aquariums that even include a shark tank. Sitting one Palm Beach’s most beautiful beach, the Four Seasons Palm Beach hotel is easily one of the most visited Palm Beach luxury hotels. Playful yet calm and vibrant yet charming, this Palm Beach beachfront hotel boasts access to a pool and the beach, spacious and modern rooms, and quick access to everything Palm Beach has to offer. They offer guests countless amenities, including dining options, spas and salons, fitness facilities and recreational activities. Whether you want to simply relax or be out every day on a grand adventure, the Four Seasons Palm Beach hotel is one of the best Palm Beach luxury hotels. 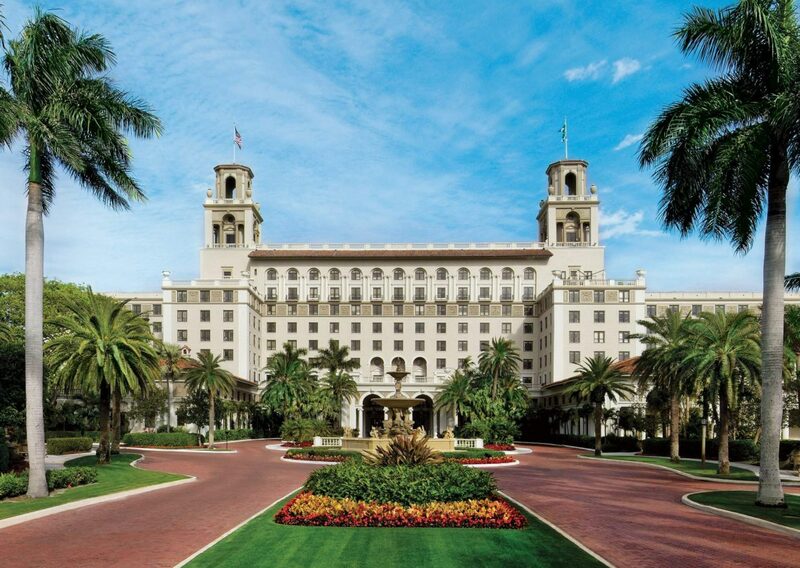 The Breakers is one of the oldest Palm Beach luxury hotels available, built in 1896. After surviving 2 fires, this amazing luxury hotel in Palm Beach has become a historical landmark in the city. The architecture and opulent aesthetics have guests stepping back into time; to Ancient Rome and 1920s New York. The Breakers has hosted guests like the Rockefellers, J.P. Morgan, U.S. presidents, and European royalty. Nowadays guests can stay in their glamorous, spacious rooms, swim in one of their 4 pools, work out in their fitness center, eat at one of 9 restaurants, and even enjoy their family entertainment center. With 5-star ratings from numerous organizations, it’s easy to see why the Eau Palm Beach Resort & Spa made the list of best Palm Beach luxury hotels. Their rooms are large and spacious, and the resort itself is large and luxurious. It sits on a private beach with tropical gardens. Guests can enjoy several spa treatments, aquatic sports and tennis, children’s programs, fitness centers, and dog-friendly amenities. The Eau Palm Beach offers guests a world of luxury and comfort at every turn. For those who have never been, Palm Beach entices guests and residents alike with its sandy beaches, beautiful weather, kind people, diverse culture, and laid-back atmosphere. It’s easy to see why hundreds of thousands visit here every year. Staying at any of the recommended Palm Beach luxury hotels will make for an unforgettable experience. Please feel free to share your Palm Beach hotel experiences.